Of Kay Marshall Strom’s 34 published books, four have been book club selections, nine have been translated into foreign languages, and one has been optioned for a movie. Her writing credits also include numerous magazine articles, short stories, two prize-winning screenplays, books and stories for children, and booklets for writers. Her writing has appeared in several volumes, including More Than Conquerors, Amazing Love, The NIV Couple's Devotional Bible and The NIV Women's Devotional Bible, and The Bible for Today's Christian Woman. Her work also is included in a number of compilations, including various books from the Stories for the Heart series. Her best-known book is Once Blind: The Life of John Newton, which is packaged with the recently released DVD Amazing Grace. She also has written several books with her husband, Dan Kline. Kay is a partner in Kline, Strom International, Inc., leaders in communication training. She currently lives in Eugene, Oregon. As an activist against modern slavery, Kay Strom takes an indirect approach to calling attention to that issue with her newest fiction title, the first of three planned in the Grace in Africa series, set in West Africa in 1787. Grace Winslow, the daughter of a mixed marriage between an English sea captain and an African princess, is swept up in a slave revolt after she escapes the family compound to avoid an odious betrothal. 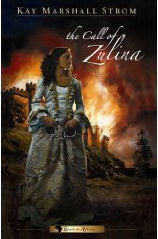 As the truth about the fortress of Zulina unfolds, Grace begins to grasp the brutality and ferocity of the family─the capture and trade of slaves. Despite being held for ransom, viciously maimed by a runaway slave, and threatened with death, Grace sympathizes with the plight of the captives. She is especially moved by the African Cabeto’s passion, determination, and willingness to sacrifice anything, including his own life, for his people’s freedom. Leaning on the faith of her nanny Mama Muco, Grace risks everything to follow her heart.